Bibb lettuce can be used for virtually anything you can think of, and not only is it versatile, but it is extremely good for you as well. We all know by now that the healthiest diets direct a strong emphasis on low-carb, high-protein foods. Consuming salads is a great, accessible way to go about this diet plan, but even as versatile as they are, salads can start to lose their luster after a while. This is when Bibb lettuce comes in to save the day. Bibb lettuce offers a strong yet buttery texture that allows it to become more than just the perfect base for any salad. The strength of hydroponically-grown Bibb lettuce leaves makes it a wonderful alternative for bread on sandwiches or burgers as well. Bibb lettuce can be used for virtually anything you can think of, and not only is it versatile, but it is extremely good for you as well. Let’s explore the health benefits that are associated with one of the tastiest, most marketable greens that you can buy today. Since Maryland Bibb lettuce is hydroponically-grown, it is full of water. This allows it to be very low in calories. In fact, a cup of shredded locally-grown Bibb is only seven calories! Since Bibb lettuce is so low in calories, it is also very low in fat content. One cup of shredded Bibb contains only 0.1 grams of dietary fat. 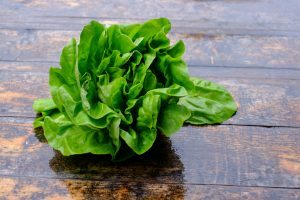 With such low fat, and nearly no saturated fat at all, it is no wonder why Bibb lettuce is great for those who are looking to shed a few pounds. Dieters looking for low-carb veggies need to look no further. Organically-grown Bibb lettuce offers just 1.2 grams of carbohydrates per cup. This makes Bibb a great alternative to bread for dieters who love burgers and sandwiches, but can do without the buns. A large contributor to the number of carbohydrates Bibb lettuce has is its fiber content. While Bibb doesn’t provide as much fiber as some other darker, meatier greens, it does provide 0.6 grams of fiber per cup. If you’re looking to increase your fiber intake, add some fibrous veggies to your Bibb salad or wrap. While Bibb lettuce is not a significant source of protein, it is a great vessel for any kind of protein that you prefer. Wrap Bibb around a juicy cheeseburger or opt for your lobster roll to be plated on a bed of Bibb instead of a carb-heavy bun. Shrimp salad, steak, grilled chicken, seared tuna, etc. are all viable options for being wrapped or plated with Bibb lettuce. This entry was posted on Thursday, April 12th, 2018 at 3:43 pm. Both comments and pings are currently closed.